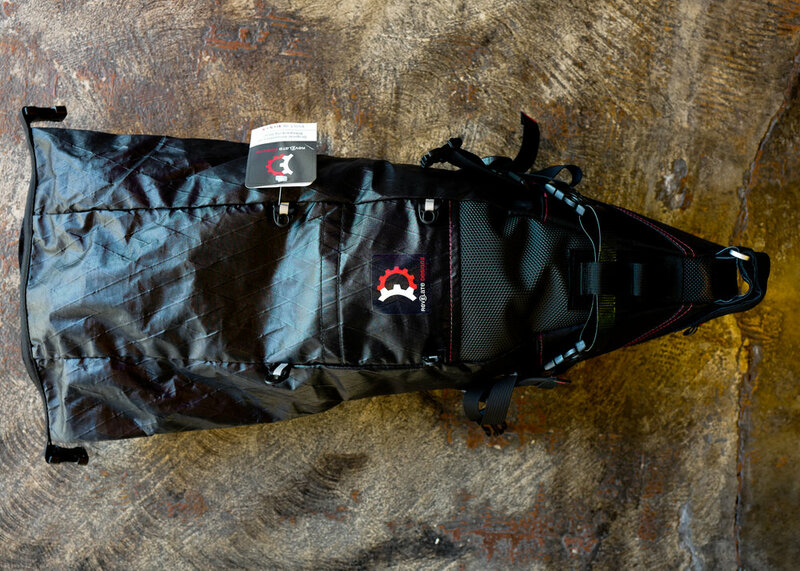 One of the most essential pieces of any bikepacking kit is the venerable seatbag. 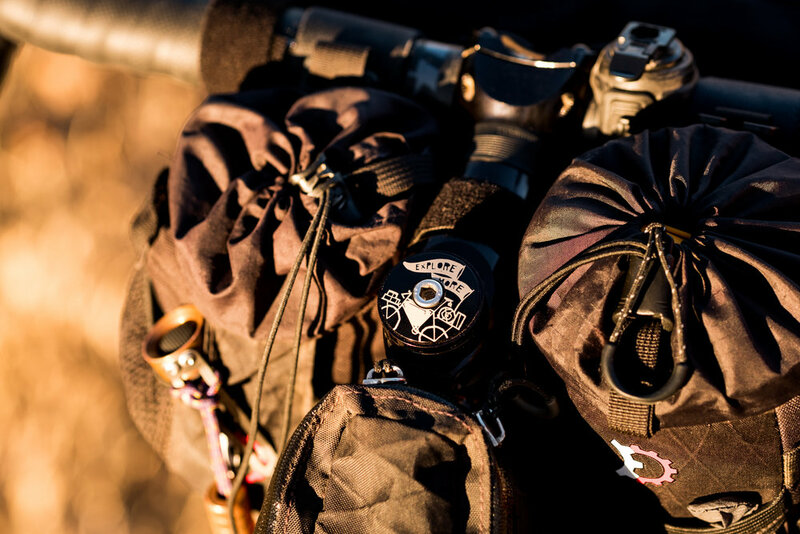 We frequently field the question “what bag should I buy first?” when people are beginning to collect the necessary gear for their first bikepacking adventure, and the answer is always the same: seatbag! There are many manufacturers and designs available these days, but most of those designs can be narrowed to two basic styles. 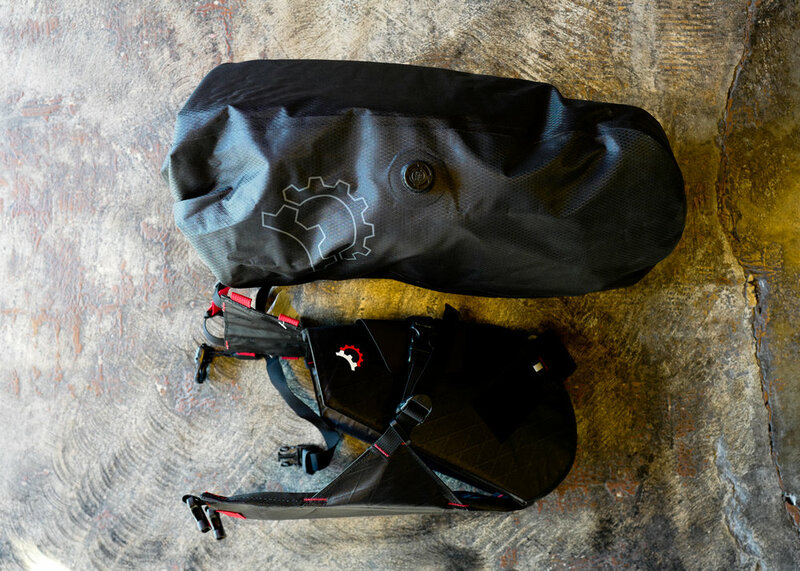 When it comes to choosing a seatbag, one nice way of narrowing down the growing list of great bags to choose from, is to consider the difference between one of the two most popular styles: Option A is a one-piece bag, (essentially a drybag sewn into a more or less rigid shape and outfitted with harnesses and straps to secure it to your seatpost and saddle), and Option B: a two-piece seatbag system, where a drybag can be easily removed from a harness that remains attached to your bike. 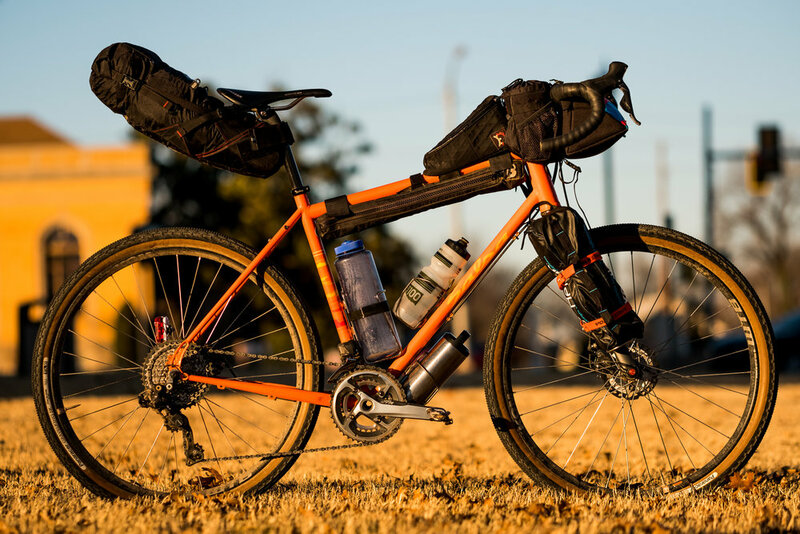 Option A is the tried and true bikepacking seatbag setup, sensitive to the ethos that the more you got going on, the more things can go wrong. As more two-piece seatbag systems are innovated however, the use of lighter weight materials and the availability of smaller-sized two-piece systems means that plenty of bikepackers out there will gravitate to these setups for the advantages they provide over the more traditional one-piece seatbag. The main virtue of Option B is convenience; it’s easier to pack and unpack a drybag full of gear if you can remove the bag from its awkward horizontal orientation when attached to the bike, and it can be helpful for the contents of your seatbag to be easily portable unattached to the bike. One downside of Option B is the dirt, sand, and/or water that can accumulate between the harness and drybag if riding through inclement weather. The design of some 2-piece systems such as the “Mr. Fusion” by Porcelain Rocket reduces the likelihood of this buildup with a more streamlined harness footprint than that of the Terrapin System (profiled below). The drybags included in two-piece seatbag systems are also more prone to wear and tear than the more sturdy designs of one-piece seatbags but are relatively cheap and easy to replace. 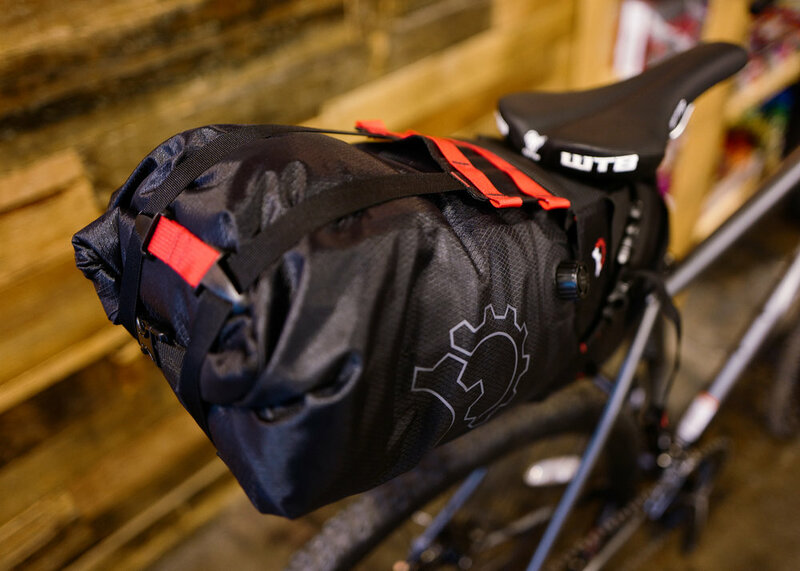 Besides deciding between a one-piece seatbag and a two-piece seatbag system when strategizing storage options for the rear end of your bikepacking rig, it’s good to give some thought about the style(s) of seatbag riding that you want your setup to serve. There are three principle ways you can go, with an infinite number of subtle variations between them: TUKT, DIALD, and STUFT. 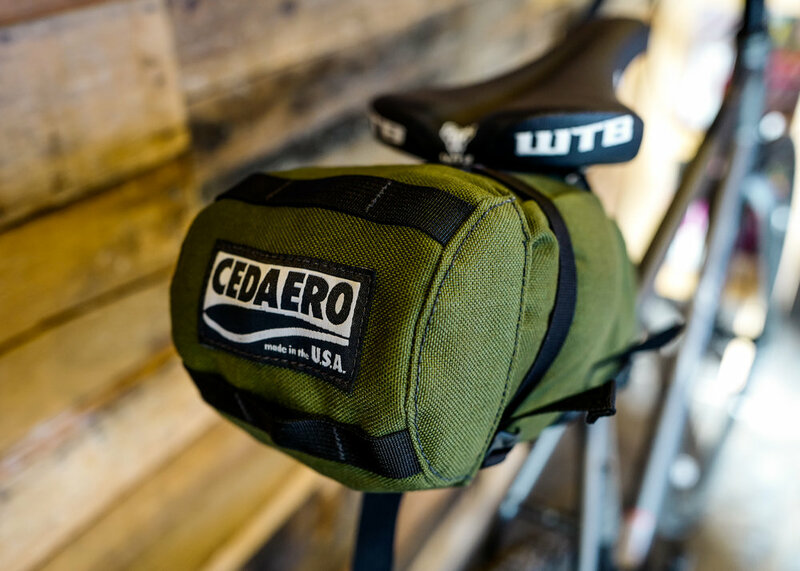 Even stuffed to capacity, the Cedaero Drummond Drawn Seat Pack is designed to ride TUKT. Ideal for self-supported ultra endurance cycling events requiring a small range of apparel and gear (i.e., not a snow event or multi-day tour), the Drummond can also serve as a helpful addition to your overnight bivouacking rig. Strap a sleeping bag, pad, etc. to your handlebar, and the Drummond can accommodate a one-person bikepacking tent, with a little room to spare. You could eliminate the camp towel and spare clothes and fit the remaining items into the even more TUKT Cedaero Alger Draw Seat Pack. If you don’t want to fuss (too much) about narrowing down your gear list to the necessities only, the Revelate Designs Pika offers a good deal of storage capacity with a view to keeping your setup DIALD. A great all-purpose bag, the Pika features a cinching strap in the middle of the bag, which divides it into a main compartment and overflow space. A multi-day tourer could confine a minimalist collection of gear to the deeper compartment and utilize the overflow space to store food and supplies that might need to be accessed quickly along the trail. 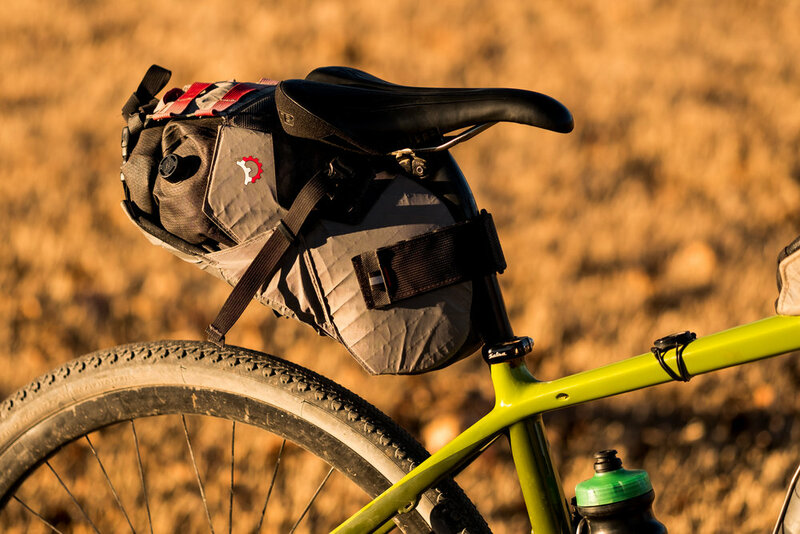 Revelate Designs makes a larger seatbag called the Viscacha, if you like the idea of a one-piece seatbag but have storage needs that sound closer to STUFT. The Pika is best suited to minimalist bikepackers. For multi-day events that require a large amount or wide variety of gear, it’s reassuring to have a bag with the storage capacity to get STUFT. When choosing a seatbag it’s important to consider not only the gear you intend to set out with and carry with you for the duration of your journey. Think about the additional storage space you’ll need along the way for food, say, if you are traversing a stretch with little to no opportunities for resupply. Multi-day tourers will often fluctuate between a DIALD and STUFT seatbag setup, depending on the demands of the day. 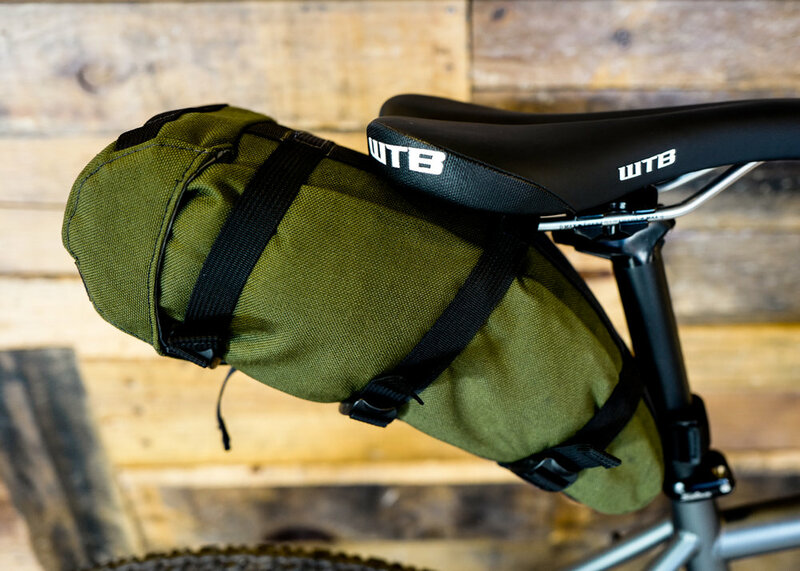 A bag with maximum capacity also simplifies the process of throwing everything on your bike for an evening of bike-glamping with friends. Note that while the Terrapin System can easily go a lot more DIALD than is pictured here, the size of the harness the bag secures to prevents you from riding truly TUKT. The Pika can roll to a smaller size than the Terrapin System can go, but it’s ability to go TUKT is still somewhat restricted by the dimensions of its lower panel. Finally, consider that the more gear you store in a seatbag the more likely it is to shift during travel. The other night I hastily filled my Terrapin System with more stuff than I care to admit, and it was swaying all over the place as I rode out to the lake to spend the night glamping with friends. No big deal. The ride was an easy one that I’ve done dozens of times before. On my next adventure, however, you can be sure I’ll be riding as DIALD as possible, TUKT if I can, keeping in mind what I might find myself lacking if I don’t ride with a seatbag that can get STUFT. At some point this past weekend, when the shop hosted the first of what we hope to become a monthly bikepacking excursion, some of us (ahem, me) thought it would be funny and/or appropriately inappropriate to title this ride report “Where’s Trey’s beans?” So I have. But, honestly, now I can’t recall what my reasoning was, or even the joke really. The weather was dreary the morning after I roused myself from a thankfully dry night spent in my bivy, but the company was the opposite. I was one of the last to wake. Folks were bustling about, stowing tents, and loading gear bags back onto bikes. Some people – either already packed up or not yet bothering – were gathered around the rekindled remains of our campfire from the night before. After quickly stowing my sleep system in my front roll bag and reattaching it to my bike, I grabbed my coffee-making implements and left the remainder of my gear (a lot of gear… I’m thinking, “Geez, how much did I bring? !”) in a haphazard assortment of piles and made my way to the picnic tables where a handful of folks had their stoves out making pour-over coffees and chewing on meager breakfasts. 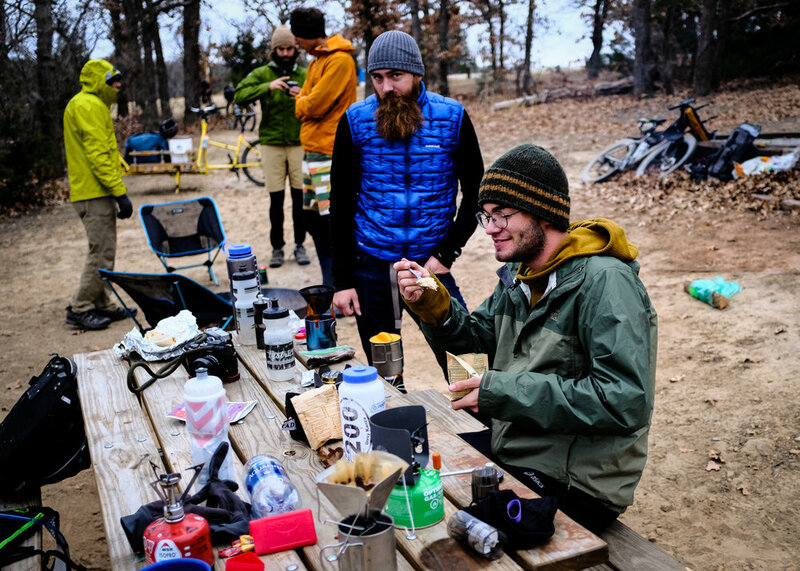 Since we were bikepacking in Oklahoma, the conversation passing between the smiling, bed-headed faces naturally turned to the beans of Hoboken Coffee Roasters, and, yeah… “Trey’s beans” was perhaps an inevitable pun. But what about the joke had made it seem to me a fitting epitaph of the trip? Nothing, really. Racking my brain after the fact, reaching back through the fog that bikepacking adventures sometimes (okay… always) cast about the halls of my memory, trying desperately to get at least a draft of this ride report down on the page, I came up with nothing, at least not about the joke. What I did remember, very clearly, was a feeling. It was the feeling of a slow sort of solidarity that I had been dimly processing in the back of my mind since the night before. 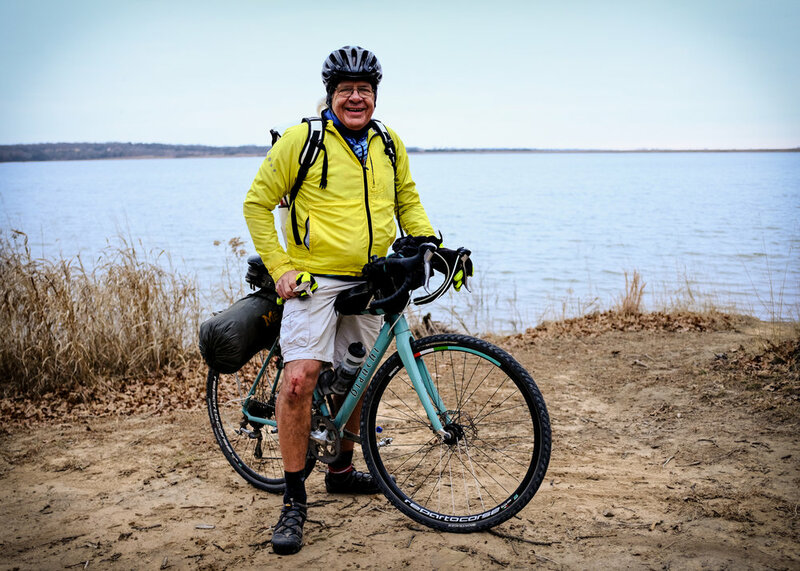 I traced the feeling back to the twelve-mile ride out to Lake McMurtry West, when it became clear that riders of widely varied cycling experience had turned out for the event. For one person, the ride out to the lake was his longest ride on a bike, and he was doing it loaded. We slowed the pace on the straightaways and let people tackle the handful of modest climbs at their own pace. We stopped at intervals along the way to have the interspersed, pulsing red lights regather into a swarm. I traced the feeling back even earlier, to the gathering of sixteen riders and loaded bikes in the dimly lit shop floor of District Bicycles, shortly after closing time on Saturday night. We were, naturally, a bit late in departing. Fittingly enough, the most experienced bikepackers were the least ready to go and the least constrained by necessity in their gear choices. Less than five minutes before we rolled out, I was strapping the last of the obscene collection of gear I had chosen to pack for a sub-24-hr. trip. Someone remarked how minimalist I looked when I carried my gear into the shop on my back, and how overloaded all the gear looked on the bike. I agreed, I was overpacked: bivouacking only in the sense of sleeping in a bivy – otherwise, glamping. And I wasn’t the only rider foregoing creature comfort. Other rigs were much more minimally packed. In fact, it was interesting to remark that the least experienced bikepackers were embracing the bikepacking ethos more purely than the rest; theirs were the everyday bikes with odd-shaped sleep rolls and tent bags strapped onto handlebars and racks with bungee cords. 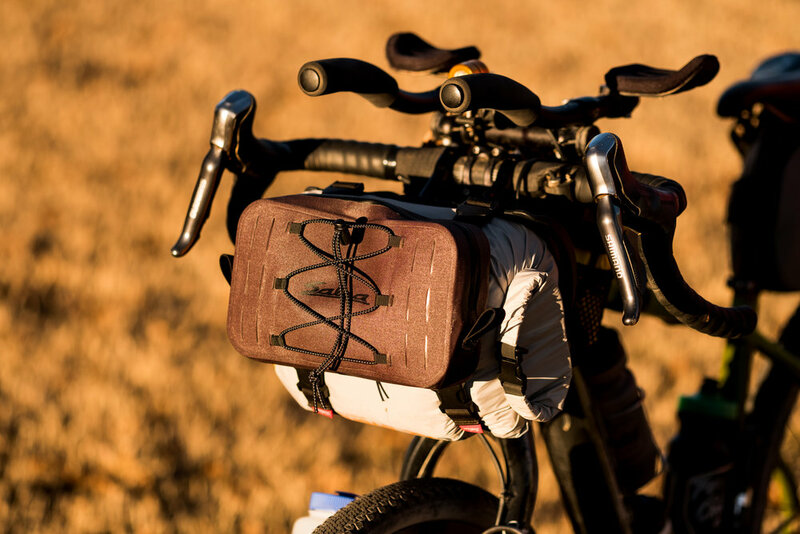 JT’s Surly Cross-Check was transformed into a bikepacking rig simply by installing a tangle bag on the frame, strapping a sleep pad and stuff sack to the rear rack he uses to commute, and dangling a Ti mug from his flat pack. 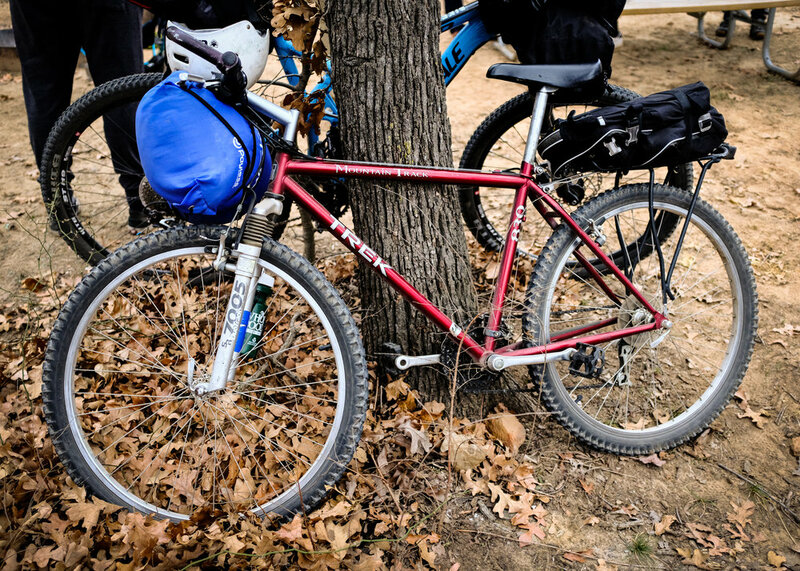 Three riders from Tulsa – one of whom was the guy doing his longest ride ever on a resurrected Trek 830 – were new to bikepacking and had more fun than maybe anyone else in camp. 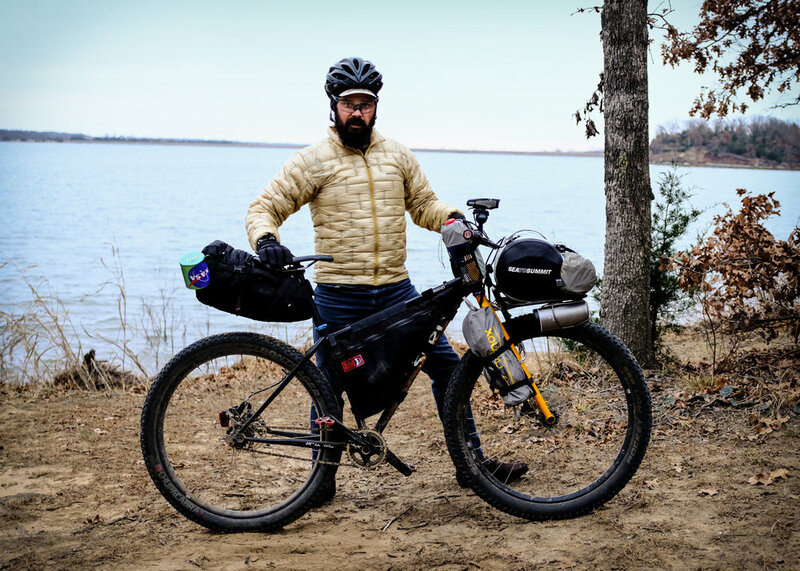 Hayden Payne made himself a bikepacker by strapping a sleeping bag to the handlebar of his full suspension Niner and wearing a backpack. 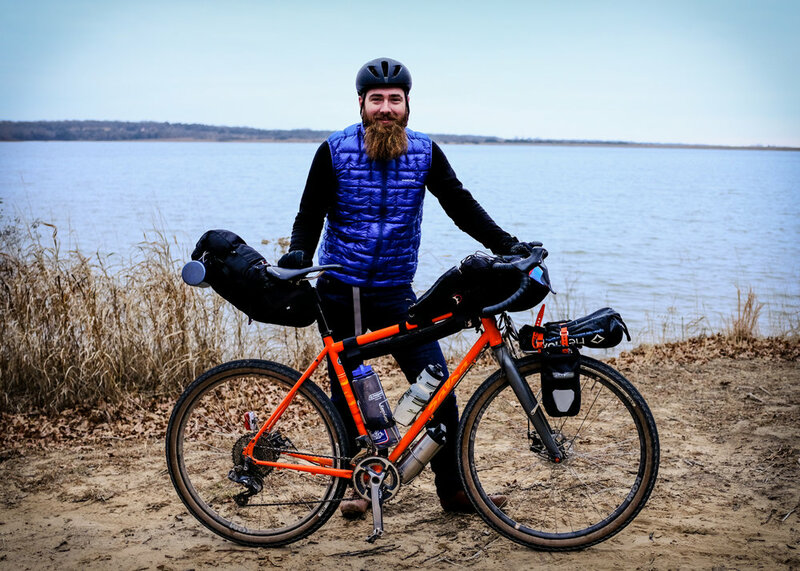 An experienced bike rider who was also new to the bikepacking experience, Tyson Branyan, used a backpack he earned as a DFL Trophy in the 2014 Land Run 100 and a rack attached to the rear of his cross-style Bianchi to haul most of his required gear for an overnighter. His wife, Cathy with a C, did bring some supplies to camp by car, and we were happy to her join us camping even though she didn’t do the ride. Keith Reed has a special place in my recollection of this ride for deciding at the last minute to join us. A custom Scissortail cargo bike makes it really easy to pack up what you need for a night beneath the stars and pedal away from the lights of town in your work clothes. Keith Reed's Custom Scissortail Cycles cargo bike, the "Jos Express"
There were faces new and old. 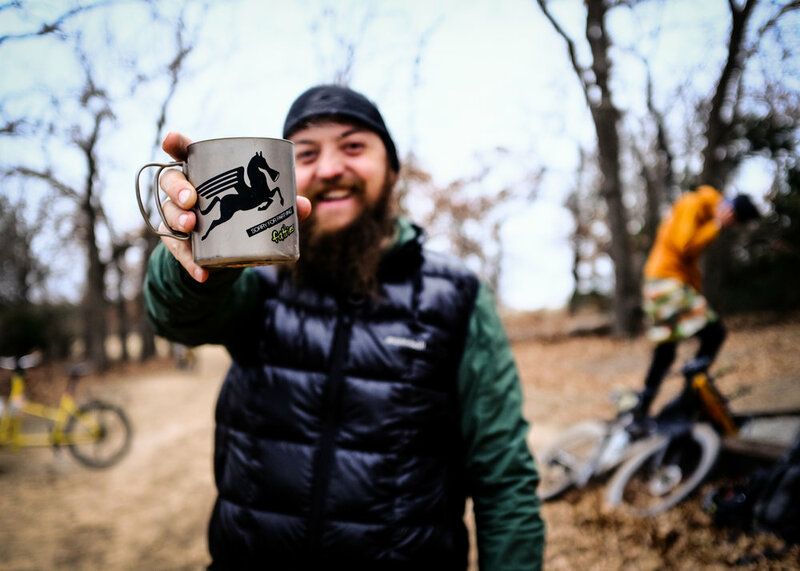 Adam Blake from Gravel City Adventure and Supply Co. had made the trip from Emporia, KS to ride with us. I hadn’t visited with him in ages. On the way out to the lake, he pointed out to me that this was our first bike ride together, even though I have only ever known him around bikes. Matt Fowler, aka the Gravel Guru, had travelled with Adam, and as a longtime fan of his photography and vlogs it was a treat for me to get to know him a bit. Some riders I knew better than others. There was one dude there with whom I have clocked thousands of bikepacking miles, but you probably wouldn’t know him. There were bikes there – like, Austin’s and Tyler’s – that I’ve seen packed and unpacked in nearly every configuration, while some other rigs I had never seen before. Some the world has never seen before. All these faces and machines dug up in the excavation of my memory, taken together, made me realize how to think about the feeling that I had associated with that gag about “Trey’s beans.” The joke itself didn’t matter. 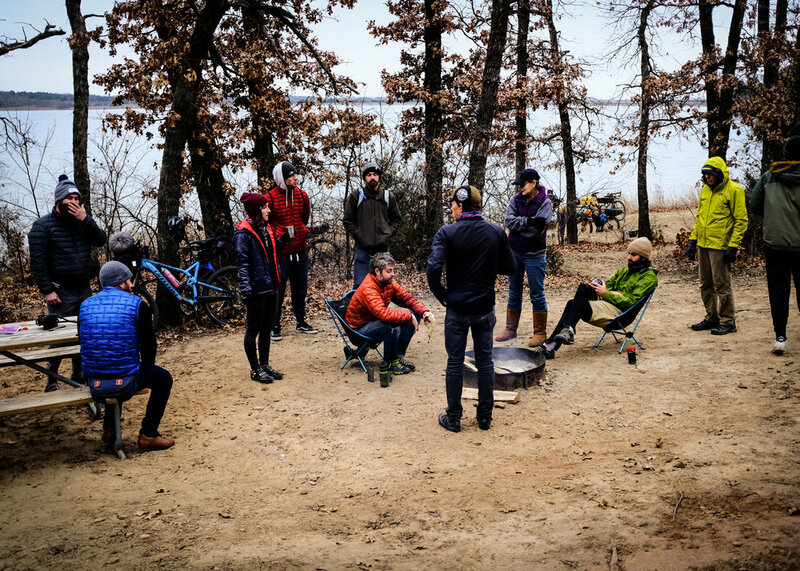 What mattered was the free and easy conversation started up among a group of people who differed in age, occupation, riding experience, camping philosophy, and in other ways we’ll never know about. What mattered was the fact that we were joking around while everyone was a bit stressed about rain that was promised but never arrived until after the trip was done. 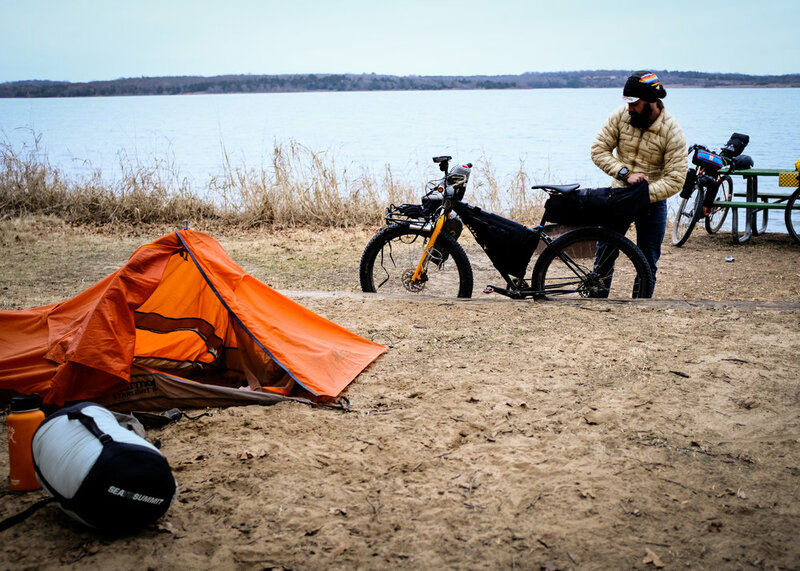 What mattered was that the most experienced bikepackers in camp were having an experience as novel as the least experienced bikepackers in camp, precisely because of the ride was being shared by veterans and first-timers. The presence of people who had never had a bikepacking adventure before made an adventure out of a bikepacking trip that I’ve made several times before (in terms of destination and gear). We knew we wanted this ride to encourage people to try bikepacking that had never done so before. We talked about it, strategized about how to make people feel welcomed and challenged at the same time, but I never gave any thought to this kind of ride being a new kind of experience for me. I’ve known about the virtues of bikepacking for a while now. I’ve seen places bikepacking that I could never see otherwise. I’ve formed lifelong bonds with people through experiences bikepacking. I have met people whose bikepacking experiences and capabilities far outweigh my own, and I will always have them to teach me how to get better at it. But from now on I’m going to make more of an effort to bikepack with people new to the game, to help teach me how to enjoy it more. Tyler Siems' MTB Abomination: Glamping Edition. Give him a follow @getwide! Whether spending one night at a destination ten miles from your home or venturing out into the wilderness for a multi-day journey, getting ready to go bikepacking involves thinking about three essential concerns: water, food, and shelter. Obviously, your need for water and food - and, therefore, your need for food and water storage - will depend on how long and/or far you intend to ride and how many opportunities for resupply there will be along the way. A good rule of thumb for water storage for bikepacking is to provide yourself at least 1 oz. of water for every mile you intend to ride. If I had to ride a 100-mile stretch with no source for refill, then I would start out carrying no less than 120 oz. of water. Food intake depends on your body type, metabolism, and dietary restrictions/preferences, but whoever you are or however you like to eat, listen to your body: if it tells you it's hungry for something and that thing is at hand, then eat it. Also consider carrying a small variety of food options, especially if you're taking on a longer journey. Just because something looks good to eat when you're comfortably packing, that doesn't mean it will look good to eat when you're fatigued, rain soaked, or sun baked hours or even days later. Give yourself a variety of food options on the bike so no matter what state you're in, you'll always be able to choke something down. Most experienced bikepackers will find themsevles carrying a bag of M&M's, Sour Patch Kids, or some other form of junk food that they'll always be able to eat, no matter what. Every bikepacker will have need for some amount of food and water, and every bikepacker will have some difference of opinion with the next when it comes to ideas about an appropriate shelter. 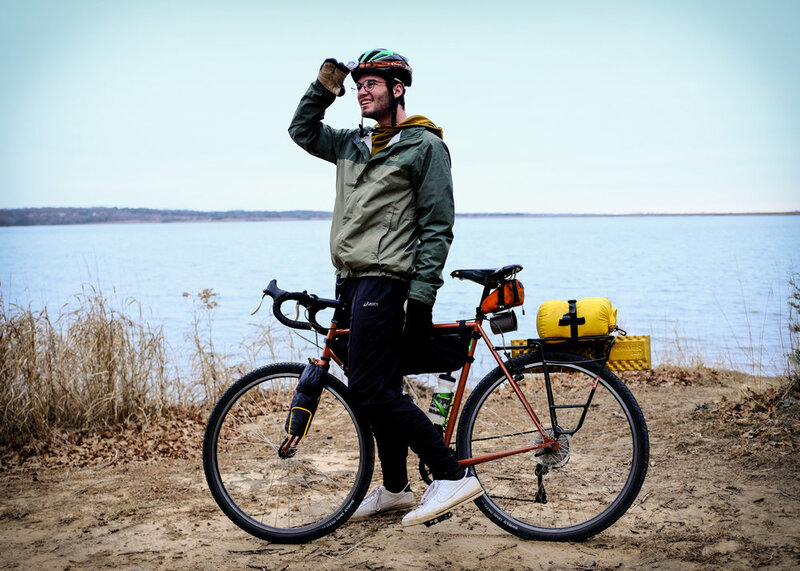 @getwide Tyler Siems' bivouacking All-City Cycles Nature Boy 853. This is where things can get a little difficult for people looking to get started bikepacking. To know what your needs are in the department of shelter, you have to have some idea of what kind of bikepacker you are. But how are you supposed to know what kind of bikepacker you are if you've never gone bikepacking? A good place to start answering this question for yourself is to consider where you fall on the spectrum of bikepacking philosophy. There are two extremes of bikepacking theory and practice that every rider is going to fall somewhere between: bivouacking and glamping. 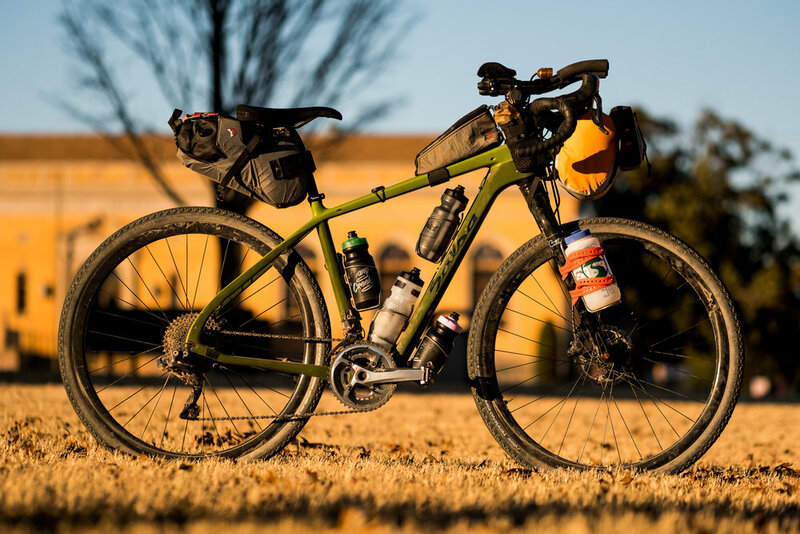 Bivouacking represents the essence of simplicity and minimalism; you venture out on a bicycle for a night or more with the bare minimum of gear. Your shelter may consist of a tarp, bivouac sack (or bivy), hammock, a sleeping bag thrown on the ground, or some combination of these items. You might bring a change of underwear or socks if you bring any additional clothes at all. Depending on weather conditions, you might decide to carry a rain jacket or portable winter coat, gloves, or hat, but the idea is that you bring only the clothes you absolutely need, not the clothes you may necessarily want. And you don't bring much more than you can carry by wearing, reducing the need for storage space on the bike itself. Nutrition bars and trail mixes are the go-to "meals" of the bivouacker. If you go to bed completely satiated, unable to eat another bite, then you're not bivouacking. If you sleep in complete comfort, with no draft or foreign object intruding on your slumber, then you're not bivouacking. If it takes you more than five or ten minutes to pack up in the morning and pedal off into the sunrise, then you're not bivouacking. Kids can bikepack too! Seth Wood and his son Mark headed out for an overnighter. Check out Mark's bivouac setup! The Ultimate Glamping Machine: The drop-bar Surly Pugsley "The Drugsley". Glamping is the school of bikepacking for the creature of comfort. You carry everything on the bike that you can imagine having some possible need for, and you give zero thought to the difference between what you brought and what you actually ended up using. You likely don't consider the possibility of sleeping outside without a tent big enough to change clothes in, and your sleeping bag only ever gets used when it sits atop a pillowly air mattress that compensates for rough or uneven surfaces. You have refined opinions on the virtues of various inflatable pillows, and you've sampled the range of dehydrated meals available at your local outdoor supply store. If you fall asleep shaming yourself for all the grams you could have shaved leaving your portable camp chair at home, then you're not glamping. If you have no means of warming up your toes and buttocks at camp, then you're not glamping. If you have not shopped for a fanny pack that will allow you to bring more unnecessary consumer products with you on your regular rides, then you're not glamping. Spoiler alert: we LOVE bike-glamping! Most of our short overnight adventures fall a lot closer to this version of bikepacking than bivouacking. @unlearnpavement Bobby Wintle's Glamp-Mobile Salsa Cycles Cutthroat. Whatever bikepacking trip you are thinking about undertaking, no matter how long or how removed from civilization, you can teach yourself a lot about what you need to prepare for that journey by considering where you want to fall on the bivouacking-glamping spectrum. Extreme bike tours that feature long distances and extensive climbing will urge you closer to the bivouacking end of the spectrum in the interest of weight-savings, but that means that you will have fewer items to help you recover when you have the greater need of recovery. Bikepacking trips featuring shorter distances and less extreme riding conditions might urge you closer to the glamping end of the spectrum in the interest of fun and comfort, but then you have to ask yourself how much money are you willing to invest in gear and accessories (and how much time are you are willing to invest in packing them) for infrequent trips that never take you that far from home. Bivouacking and glamping are two types of bikepacking experience that are not really attainable in their purest forms. You're only ever going to be able to pull off something in between the two, but you'll always be closer to one experience than the other. Which one is up to you. 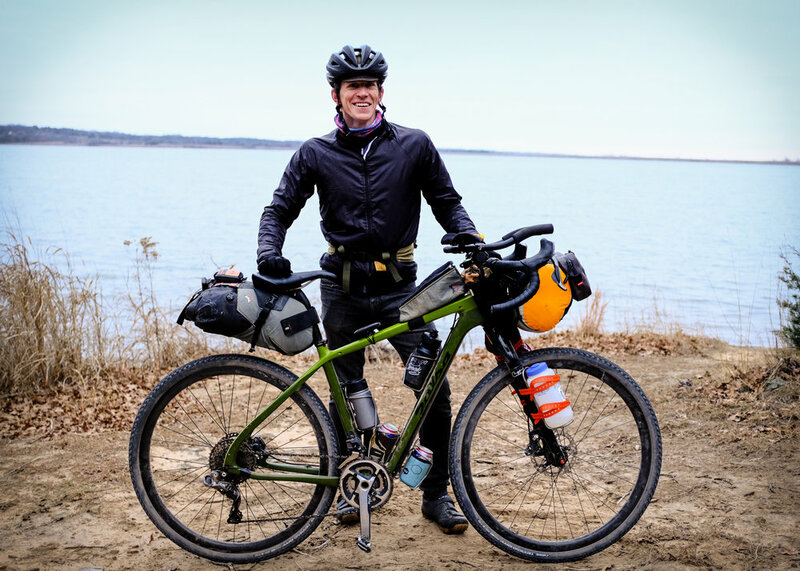 Interested in bikepacking? Let's talk about it in the comments, we love to talk gear, routes, and whiskey choices. But mostly whiskey choices. Click these images to make them grow! Written by Seth Wood, edited and photographed by Tyler Siems.